Comfortable Viewing: Offer you a comfortable height and angle to watch and play more comfortably. Sturdy: Made of solid quality aluminium alloy, ensures durability, stability, simplicity and fashion. Adjustable Multi Angle: Features a multi-angle design ideal for recording or watching videos and reading at a comfortable angle. The adjustable stand is smooth but firm so your phone will stay at the angle you choose. Convenient Charging/Syncing: Charging while watching, never worry about your smartphones running out of juice when you watching movies or photos. Simple Cable Management: Accessible back openings let you easily manage charging cables. Anti-slip Design: Rubber pads and feet can protect your device from scratches and sliding. Elegant and Modern: Compact and space-efficient, ideal for placing on the desk at your office or home. Wide Compatibility: Apple iPhone X / 8 / 8Plus / 7 / 7 Plus /5 / 5s / 5c / 6s /6s plus / SE, Samsung Galaxy S8, S7, S7 Edge, S6 Edge plus, Note 5 4 3, LG G6 G5 G3, HTC one M8, Google Nexus 5 6, Sony, Huawei P9 P8 Mate 9 Mate 8, ZTE, OnePlus and other smartphone. Note: The best angle to keep the tablets stable is 35°~ 60° and placed horizontally. 【UNIVERSAL COMPATIBILITY】 Work with all 4 to 10 Inch smartphones tablets and e-readers, such as Nintendo Switch, iphone 8 / X / 6 / 6s / 7 / 7 plus, Galaxy S8 / S7 / S6 / Note6, LG, Motorola, HTC, IPAD , Samsung Tab, Google Nexus, Kindle and so on. 【FULLY ADJUSTABLE & PROTECTIVE】Durable aluminum body, with a sturdy construction, can hold your phone steadily. Rubber cushion with shockproof and anti-skid to better protect your device from scratches and sliding. MULTI-ANGLE design makes cell phone stand possible to be adjusted to your desired angle up to 270 degree. 【MORE STABLE THAN YOU THINK】Light weight, firm, durable & portable, can bear up to 100 ounces. 【SMART LIFESTYLE】 Hands-free, make it possible to play games, use Facetime and Youtube while charging. Play a good role in your office, kitchen, bedroom, dining table. Accessible back openings let you easily manage charging cables. 【Friendly Customer Service】 30-day return for any reason, 18-Month warranty, lifetime technical support. The InnKoo is a self-owned brand. Products purchased from a non-authorized seller/distributor may be fake and will not be covered by our warranty. 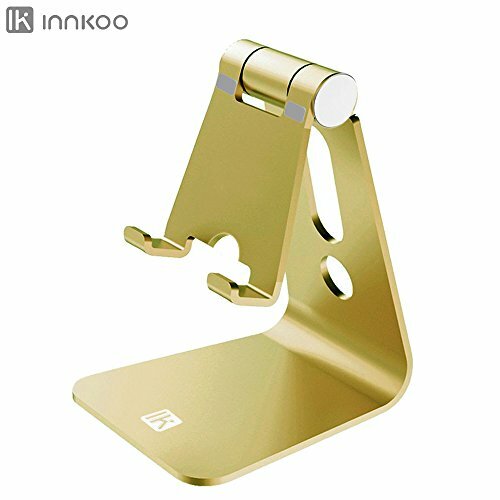 If you have any questions about this product by InnKoo, contact us by completing and submitting the form below. If you are looking for a specif part number, please include it with your message.